Orchard Fresh Nutrition : Goodness, it's a wrap! Sometimes lunch can be a tricky meal to plan, create and execute. Is anyone else with me on this one? I mean, you're busy rushing around doing things, but you're hungry and the tummy is starting to rumble. You want something quick, but still satisfying. Not too satisfying, else you risk feeling heavy, sluggish and tired in the afternoon. But you need to make it through 3.30-itis and avoid caving to the chocolate bar as an afternoon pick-me-up. If you have your nutrition priorities right, you'll be seeking a lunch composed of low GI carbohydrates, some protein and a filling dose of veggies. So what takes your fancy? I must admit I have fallen into a bit of rut with lunches. The ol' tin of salmon and a salad is a great quick, nutritious and filling staple. 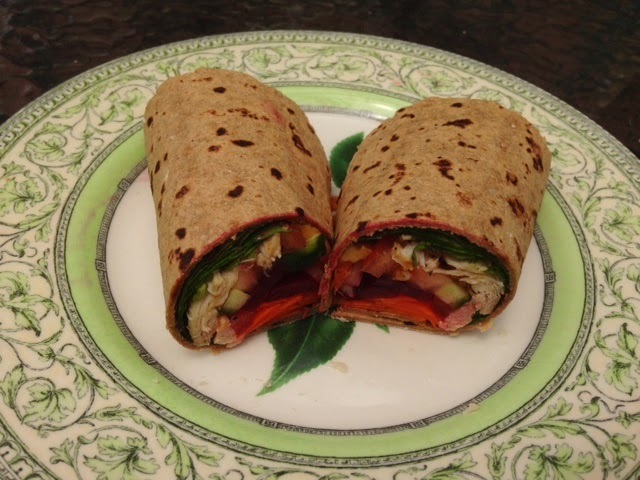 Recently however, I've been in search of something different, so I revisited an old favourite: Goodness Superfoods wraps. Goodness me, there is a lot to love about these wraps. For one, they are a Victorian based, Australian owned and run company; and what's not to love about that? Even better is that the star ingredient of all Goodness Superfoods products, their BARLEYmax resistant starch, was developed by the CSIRO. This means Goodness Superfoods products are unique, supplying twice the amount of dietary fibre as regular grains and four times the amount of resistant starch, with an impressively low GI to boot. "Yeah, so what?" you may be thinking. Well, did you know that fibre is needed to keep you full, help with weight management and promote a healthy digestive system? 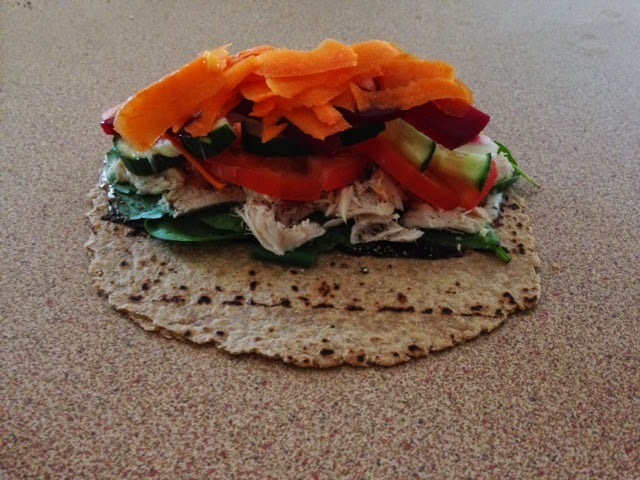 Plus, just one Goodness Superfoods Barley wrap provides 35% of your daily fibre requirements - how good is that? 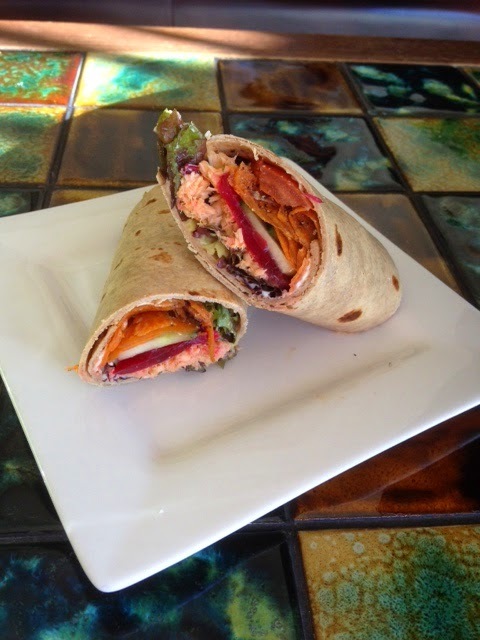 As you can see from these few options I've trialled above, these wraps can be used for breakfast, lunch or dinner. You could also use them as a healthier pizza base, a high fibre crepe or toasted crisps... the possibilities go on! Goodness, these are a convenient, healthy and tasty meal option which I certainly recommend you add to your repertoire. You can find out more about Goodness Superfoods Barley wraps and their range of breakfast cereals, porridge, muesli bars and grains at their website (you can pick up some more tasty recipe ideas there too). ** Please note the thoughts and information provided in this post are my own and I have no affiliation with the Goodness Superfoods company. If you would like more information about any Goodness Superfoods products, you can check out there website, as mentioned above.